I have been in Minneapolis since Monday to participate in #SAPWeek. #SAPWeek is a unique experience where EMC brings in their customers, partners and experts, from all over the globe, into a concentrated deep dive whiteboard jam session for a few days. I was at the first in Santa Clara in 2007 and have been attending many each year since. 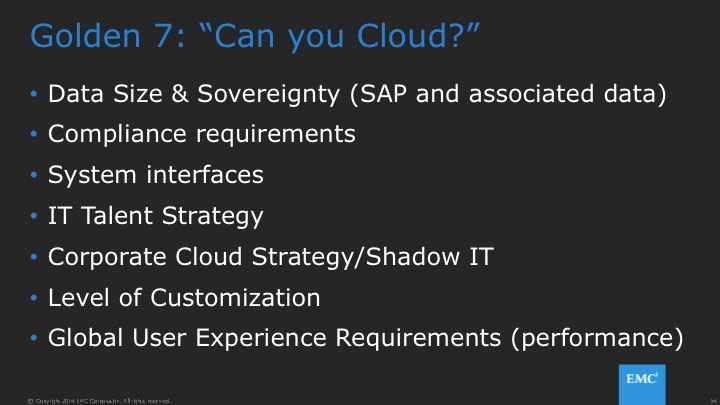 There are very few things that are as consistently more rewarding as exploring the future of enterprise landscapes that run SAP, and that is #SAPWeek. Right now, customers are re-platforming in droves. Here in the mid-west the topics of interest ranged from “Is it time to go to X86/Virtualization”, to “what is HANA TDI” (and I should I use it), to “is the cloud real for mission critical”. The quick answer to whether you should roll out HANA with an appliance or TDI is: TDI. You are going to save 20-30% or more of OPX getting off the appliance model. If someone is advising you otherwise, get new advisers. Check out my blog on “the HANA Puzzle” for more on that story. Why Not – What about my environment hinders me from sending workloads to the cloud. Make sure you socialize this item. I am finding these “sacred relics” of the past are actually breaking down as your cross the lines of business. Cloud is compelling. You long-term operational costs with significant reductions. This entry was posted in Uncategorized and tagged Big Data, Cloud computing, Data Center, IT Transformation, mission critical applications by Andy Sitison. Bookmark the permalink.